A full-size image (484 kb) is also available. Although crowded and seemingly complex, this interchange consists quite basically of three pairs of ramps connecting I-190 with the Peace Bridge, Porter Avenue and Busti Avenue. The area's jumbled appearance is a result of several additional features: the customs plaza, a railroad, a bicycle path, and so on. Beginning at Porter Avenue is a divided roadway running along the edge of Front Park, immediately adjacent to Busti Avenue. This is the original approach to the Peace Bridge, and is called Baird Drive southbound and Moore Drive northbound. Note the prominent right turn channels entering this road from southbound Busti and westbound Porter Avenues. This approach leads to the Peace Bridge toll plaza and from the United States customs plaza. Interestingly, traffic leaving the plaza by this route crosses traffic entering it from the Niagara Thruway ramp. Along the left side of the plaza runs a divided roadway, intersecting Busti Avenue at the top edge of this photo (note another right turn channel leading to southbound Busti Avenue). This roadway is a connector between Busti Avenue and I-190 to and from the south. It carries the NYSDOT reference route designation 951J. The northbound side of this connector is joined by a tight right turn from the customs plaza. The southbound connector shares an underpass of I-190 with the CSX/Amtrak Niagara Falls branch railroad. A second pair of ramps serves to connect Porter Avenue (bottom) with I-190 to and from the north. The ramp entering I-190 crosses over the exit ramp to Busti Avenue. The offramp to Porter Avenue is joined on its right by a driveway. 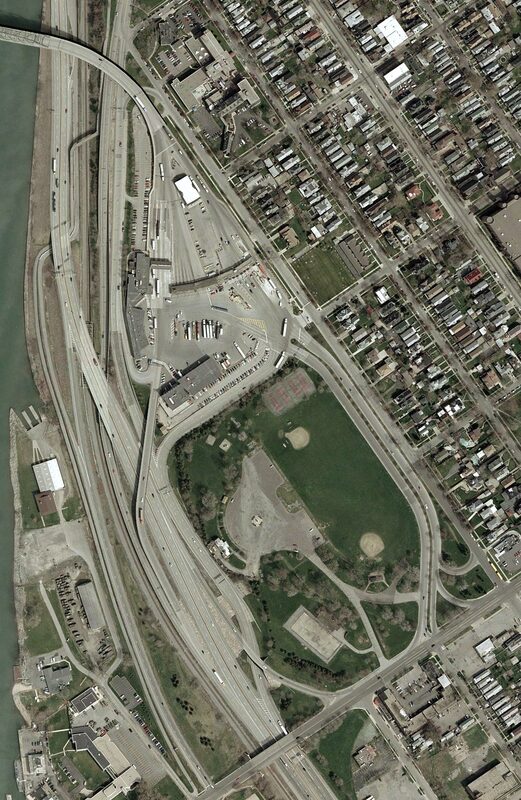 This driveway crosses under I-190, along with a bicycle trail, and runs between the railroad and highway to a pumping station off the top edge of the photo. (There is even a ramp directly from northbound I-190 to this station, visible here almost beneath the Peace Bridge.) The bikeway jogs once more over the railroad and runs parallel with the Busti Avenue connector. The Porter Avenue and Busti Avenue ramps together provide for a full connection at this interchange with local streets. However, the connection between I-190 and the Peace Bridge is not complete. Only I-190 to and from the south is directly connected with the bridge, by means of ramps branching from the Busti Avenue pair. The northbound exit ramp to the Peace Bridge, in particular, is the newest connection. Until the 1990's, northbound access to the bridge was via the Busti Avenue exit. Even today, traffic between the Peace Bridge and I-190 to and from the north must use the original bridge approach and a short stretch of Porter Avenue.